We have a great range of luxury dog collars, leads and harnesses to suit every fashion conscious pup. From luxury leather dog collars and leads to simple webbing collar and lead sets, you are sure to find your perfect designer dog accessory here. Most of our designer dog collars, leads and harnesses are handmade here in Britain from the finest materials. Choose from the classic leather dog collar to something a bit more fun and colourful for the summer with our range of Scrufts dog collars and leads. At Chelsea Dogs we have a fabulous selection of dog collars, dog leads and dog harnesses. Our designer dog collars come in a huge variety of stylish fabrics or classic leathers. When choosing a dog collar, dog lead or dog harness much of the decision will come from your personal choice of what you like and what looks best on your pet. Some of our dog harnesses are handmade in the UK by Mutts and Hounds. They come with Velcro fastenings so are suitable for most breed types where the straps can be adjusted for the most comfortable fit and optimum support. Choosing a dog collar is no easy task and is why many dogs end up with a drawer full of different dog collars for different occasions. We have stylish dog collars from top designer UK brands including Dogs and Horses, Scrufts and Mutts and Hounds. If you are looking for a fabric dog collar than the Scrufts range is sure to please. Choose from a great range of fun and sophisticated patterned fabrics all lined with luscious velvet and finished with a heart shaped tag. All our Scrufts designer dog collars are beautifully handmade to order for us in the UK. If your dog would look better in a leather dog collar then we highly recommend both Dogs and Horses and Mutts and Hounds. Mutts and Hounds leather dog collars are all proudly handmade in England and come in 3 beautiful styles, a grey and red organic ticking and a Balmoral Tweed that is a best seller with our dogs up and down the country. 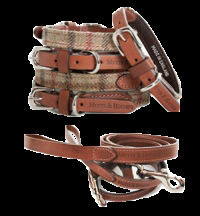 Dogs and Horses leather dog collars and leads are made from the finest leather with quality that is hard to beat. Choose from a simple rolled leather dog collar in a selection of classic colours or add a bit more fun by choosing a collar from their colours collection which beautifully combine chocolate brown leather with an assortment of pastel coloured leathers. Don’t forget to check out the gorgeous leather dog leads to match both the Dogs and Horses collars and the Mutts and Hounds collars. Most of our luxury leather dog collars and leads are sold as sets which will save you some money rather than buying the collar and lead separately. A great dog collar for both country and city dogs is the Waifs and Strays rope and leather collar which combines classic leather with a chic rope and finished with the signature WS embossed in the tip of the leather. Pair this up with a matching Waifs and Strays ID Capsule and your dog will be the smartest looking dog in the park and will definitely get heads turning. For puppies we advise you buy a fabric dog collar which is fully adjustable in size so it should last your dog through puppyhood without the need to buy two or three collars as your puppy grows. Once your pup is fully grown and you want a long lasting dog collar then it might be time to invest in a strong, hard-wearing designer leather dog collar. Whilst your puppy is growing and learning how to walk on a lead then it might be wise to buy a dog harness which will not only give your dog more support when walking but you will have more control over your pups movements and if they do pull on the lead, you won’t risk choking or tightening around the neck which can be very painful for a pup who is pulling on the lead attached to a collar. Training your new puppy or dog requires a considerable amount of time and dedication from both owner and dog but here at Chelsea Dogs we try to provide you with the best possible accessories to aid training. Our luxury leather dog training lead is perfect for training your dog to walk to heel on and off lead and offers different adjustment lengths so you can find the right one to suit you and your dog. Made from the highest quality rolled leather these dog training leads are made to last and with the right care and proper use they will no doubt last a lifetime and are a great investment. No matter what breed of dog your have, all our dog collars, leads and harnesses are available in a great range of styles and sizes so we are sure you will find what you are looking for (and maybe something you weren’t looking for too!) here at Chelsea Dogs.